Theories on how it came into being and how to make one for yourself. We'll start with the wonderful John Dawson picture on pages 10 and 11 of Fort Vancouver: Official National Park Handbook.  aka Handbook 113, which is produced by the Division of Publications, Harpers Ferry Center, National Park Service, U.S. Department of the Interior, Washington, D.C. The woman just to the left of centre, in the red top and the light blue skirt, is wearing a Canadian Dress. She is surrounded with a fair representation of the people who one might find at a Hudson's Bay Company fur fort of the mid 1800s, from the Hawaiian man on the far left to the Aboriginal man on the far right, and the sailors, Scots, Orkneymen, French-Canadian, Canadian French, Irish, and English, in between. The fellow in the top hat, frockcoat, and tan trousers is Dr, John McLoughlin, chief trader at Fort Vancouver in 1845. The first time I saw the Canadian Dress, I knew I had to make one for myself. As my main persona is Métisse --Métisse being a woman of both Aboriginal and European ancestry-- and the Canadian Dress at that half way mark between Aboriginal and European, I felt it would be the perfect match. I drew a rough pattern for the skirt and bodice -- I already had the leggings. Then a friend popped up with a pattern for it, taken from a book called Feminine Fur Trade Fashions by Kathryn J Wilson and James Austin Hanson, showing it to be a one piece garment. (Thank you, Midori). "The Canadians under the direction of the Hudson's Bay Company's noted leader Peter Skene Ogden, invaded American trapper's domain several times, once trapping as far south as Mexico. One reason for the Canadians' success was that the HBC men took their wives with them. The trappers were more responsible to their commitments to the Company and to the brigade, and the women made camp life and travel more pleasant. 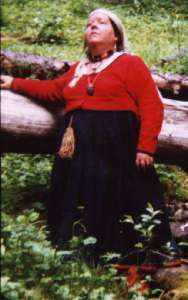 "This dress was a popular style among the Indians and mixed bloods on the Canadian frontier. Sew the the bodice pieces together as indicated by letters. The underarms should be slit and gussets added to facilitate movement. The neckline, wrists, bodice back and hemline are bound with contrasting bias fabric or braid. "One width of the skirt should make the front and two widths, the back (back is twice as full as front). Sew front skirt to bodice and back skirt to skirt band. Bodice back is gathered in on the outside of the skirt band. "These dresses were always made of wool, and favorite colors were dark blue, light blue, and scarlet. A scarf of contrasting fabric covers the bosom at the neckline." The pattern pieces are bodice front, bodice back, two gussets, and a waist band. On reading the bit about wool, I balked a bit. I have the kind of metabolism that makes wool garments of ANY kind superfluous in all but the coldest weather. Since most of the events I attend are in the summer months, wool was Right Out, and I started wondering if a heavy cotton might work. Something to keep in mind as you create your Historic Wardrobe is the vintage of the items in your contemporary wardrobe. Just today I had to send away a pair of shoes that I bought some 26 years ago -- not because they were not longer in fashion (quite the opposite they are now BACK in fashion) but because my feet are just that much too wide to wear them anymore. I still have clothing that I wear from 70s, 80s, and 90s; my personal style preference is a mélange of 70s and 80s. It's now 2004. Historically, as today, there are people who keep up with the latest fashions. Every year, these folks clean their closets and drawers out and refill them with the latest up to date fashions. Then, as now, one needed to be of a certain social standing and income level to do this more than once. Some folks keep the clothes they like and feel comfortable in, and the Devil with The Latest Fashions. And very many more folks fit somewhere in between these two extremes. One thing to decide for your Historic self is where that self fits in. For me it was easy. My Métisse, Mary Isabelle Huston, wears what's comfortable and what she can afford. Until I saw the Canadian Dress, I was content to let Mary have a maroon gingham 1850 work dress, and a un-bleached linen T-tunic and skirt made from the scrap from the work dress. There's two pair of leggings, one made from scraps of a vintage HBC blanket with pale green trim, another pair made from emerald green wide-wale corduroy with bright yellow trim, and a couple loudly stripped apron with huge pockets. Both outfits work, for Mary, for a time span between 1850 and 1870. Then came Brigade at Fort Vancouver. The year is 1845. I felt a bit odd wearing the 1850 work dress, but, I felt it was better than the top and skirt. About this same time another friend was weeding out her kit and gifted me with a couple 18th century heavy cotton petticoats, one in red and one on navy blue, with pre-cut ruffles for the red one and un-cut blue fabric for the other. (Thank you, Barbara) I put the red petticoat on as a skirt over the work dress. The next day, I wore the blue one. As Feminine Fur Trade Fashions pointed out, dark blue was one of the favourite colours the Canadian Dress. I had the skirt, all I needed was a top. A trip to the local Value Village yielded enough scarlet duck (heavy, square weave cotton) to make a top. I spent an evening with butcher paper, measuring tape, pencil, and a thrift-store sheet, to create the actual pattern pieces needed (I used to laugh at those who made things out of an old sheet first --often referred to as "making a muslin"-- but not anymore). But when I got to the part about joining the top to the bottom, I came up against a rather substantial wall: to get the fit shown in both the above picture as well as the drawing that comes with the Feminine Fur Trade Fashions pattern, there needed to be an opening of some sort somewhere. One friend suggested that if it had been made of wool it would stretch enough to get it on and off. Maybe, but Me and Wool and Summer Weather was not going to happen, so, instead, I made it a two piece outfit. The first thing I noticed right away is that this is a really comfortable outfit. The underarm gussets give one a full range of motion, and the top doesn't creep up. The second thing I noticed was that I cut the sleeves a bit too long, and because they are what's called a Coat Sleeve, they were just a bit too tight at the cuff to push up out of the way while working -- as the women who worn them historically would have had to do. Not a lot of leisure time for the average Métisse, nor servants to do the work for her. A Métis woman --unless she were a Mrs. John McLoughlin or Mrs. James Douglas-- needed durable clothing that she could work in. I had yet to cut the sleeves shorter when Barbara sent me an email with a URL for a page at the Corsets & Crinoline website --http://www.corsetsandcrinolines.com/testdb1.php?index=185007 -- that shows a bodice dated c 1810 from the Regency Period. "A white cotton high waisted bodice with a purple printed floral pattern. "Printed cottons were very popular during the Regency era. 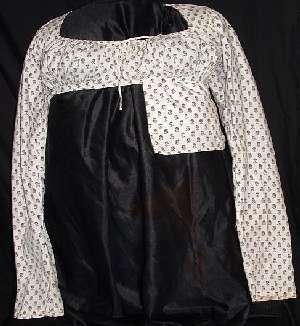 This one has a low drawstring neckline and is lined with a separate fastening linen "underbodice". The back of the bodice has inverted V groves cut into the bottom hem at each hip side of the bodice. This would allow for the bodice to be tucked into the skirt but still allow for the back peplum to hang over the back off the skirt and a small padded bustle (bum roll). "One side of the front "basque" area is missing. These sides would have been tucked into the skirt. The bust is gathered and could be adjusted by the drawstring according to the bust size."
. . . then took a last look at John Dawson's painting, and thought to myself that if the sketches/descriptions of the Canadian dress were made by fellows who never helped take one off, it *could* have been interpreted as a one piece garment. 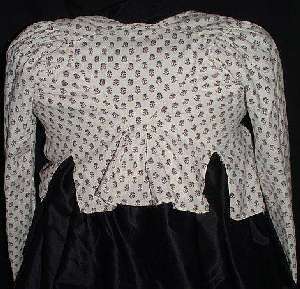 You will note that in John's picture that there is a suggestion of a centre front seam on the bodice. And after making a couple adjustments to my Canadian Dress, I, like Barbara, have come to the conclusion that the Canadian Dress has to be an adaptation of a garment quite like the 1810 Regency bodice . . . a two piece outfit. 1. It's easy to move in. 2. It's quick and easy to make. 3. Red and blue became favorite colours perhaps because red and blue were common trade cloth colours, whether it was wool or cotton. Either material would be available, both would make it durable --wool would not need to be washed as often, just a regular airing, as many wool-wearing hikers know. 4. The lower neckline and front closure would be an invaluable asset to a nursing woman, allowing quick, easy access. Most women spent the majority of their adult life pregnant or nursing. With a drawstring, the bust could be adjusted throughout the childbearing cycle. 5. The higher waistline --as shown in the Fur Trade Fashions-- would offer a garment that could be worn all through the childbearing cycle. Many lower class women only two dresses in her life time, and to have a style that could be worn, pregnant or not, would be invaluable. But the best clue of all has been under my nose for some time now -- the cover of the book Children of the Fur Trade: Forgotten Métis of the Pacific Northwest by John C. Jackson. 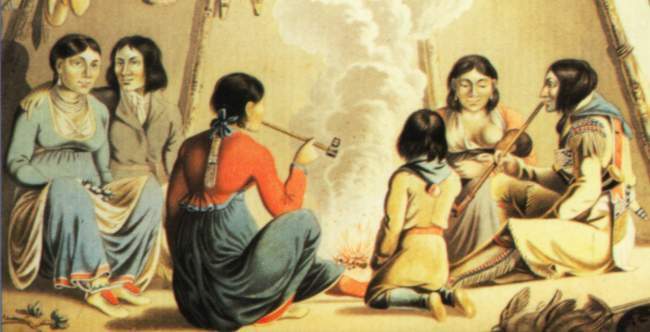 The picture Mr. Jackson used is a painting by Peter Rindisbacher entitled Indian Women in Tent. What you see below is a section of this painting that I think pretty much speaks for itself. At the age of fifteen in 1821, Peter Rindisbacher immigrated to Red River with his family and 180 other immigrants from Switzerland, to become the first artist west of the Great Lakes. He produced several sketches of this difficult voyage and at Red River, he worked as a clerk at the store in Fort Garry. He received many orders from traders and officials for paintings depicting life in the northwest. Crop failure and a disastrous flood in 1826 drove the family to move south. Just as he was gaining success as a painter, Rindisbacher died of cholera at the age of 28 years. The above biography, which can be found at http://collections.ic.gc.ca/hbc/catex9c1.htm is courtesy of the Hudson's Bay Company digital collection. The picture itself was scanned from the front of my copy of Children of the Fur Trade: Forgotten Métis of the Pacific Northwest by John C. Jackson. Do be aware that those in the greater re-enactment community who feel that Peter Rindisbacher's paintings are not a good reference, that he made up what he painted. Why? I don't know for certain, but felt that it did need to be mentioned. So after all of that, on the right we have the finised product, with leggings made from the same scarlet material as the top and trimmed with the same material as the skirt. The outfit is accessorized with a 19th century beaver top hat, pewter mug, and a wooden stemmed, pipestone pipe. Off the left side of the skirt, I have a flour sack dish cloth tucked into the waistline. There's a pale blue ribbon hanging from the handle of my mug; when the mug is empty, I can hang it from one shoulder. Also, partially hidden by the pale blue ribbon is a twined drawstring bag made of either spruce root or cedar bark --or possibly even both-- that I found at a local second hand store for $1.95 Canadian plus tax. An historic note about Métisse: it has been written that "they" had a very difficult time getting the mixed blood women away from their tobacco and into proper bonnets. If you have any comments regarding my theory on the Canadian Dress, please drop me a line at lisa AT fortlangley DOT ca I would love to talk to you about it. Fort Vancouver: Official National Park Handbook is available for sale at Fort Vancouver or by mail from the Supreintendant of Documents, U.S. Government Printing Office, Washington, DC, 20402-9325. Ask for Handbook 113. Corsets and Crinolines is a delightful site. Not only do they have images of vintage clothing, they also have some for sale.